DAY 25 - 30DaysOfAvoToast: The Fancy Appetizer - AvoSeedo - Grow your own Avocado Tree! I love appetizers for being a mini-meal before my meal. They kind of set the mood for what’s about to come. Onion rings prepare me for a burger. Fancier appetizers like cocktail shrimp prepare me for a prime-cut steak or even lobster tail. For this avotoast recipe I wanted to think of what might come before a fancy dinner. I think it’s so good you wouldn’t need an entree after it! Toast the bread and cut into forms you like using a cookie cutter. Mix sour cream with horseradish, lime juice, salt and pepper. 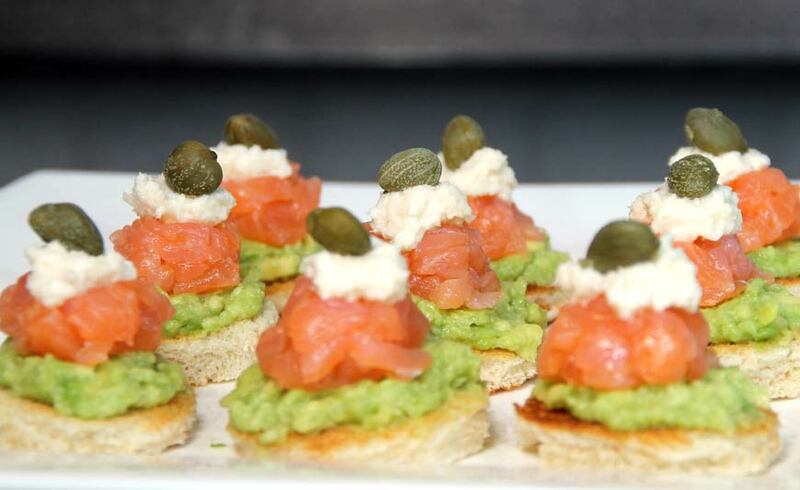 Put avocado mash, salmon, horseradish cream on toast and top with a caper. This entry was posted in Recipes and tagged appetizer, Avocado, avocado toast, avotoast, capers, fancy, horseradish, salmon, smoked, sour creme.